The second phase of the operation to extricate nine members of a Thai youth football team from a flooded cave began Monday. 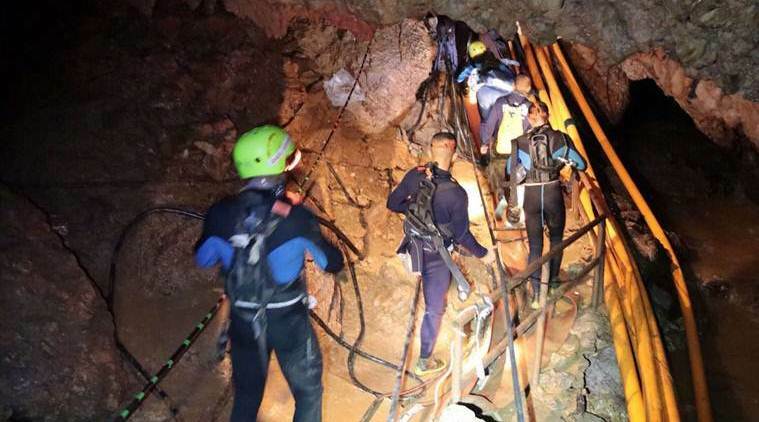 Mae Sai: Rescuers working at a cave site in northern Thailand have suspended operations for the day after bringing out four more boys out of the flooded cave system on Monday, thus bringing the total number of boys rescued to eight. Four more boys and their coach remain trapped inside the Tham Luang Non cave complex. The first boy to emerge Monday was taken by helicopter and ambulance to the same hospital in Chiang Rai where the first four boys rescued Sunday by a team of international and Thai dive experts are being treated. Two more boys left the Tham Luang Nang Non cave complex a short time later and were transferred to a medical facility on site, followed soon after by a fourth boy. The second phase of the operation to extricate nine members of a Thai youth football team from a flooded cave began Monday and was expected to yield "good news" within hours, the chief of the rescue mission told media. The dive team, led by international experts, returned to the cave mid-morning Monday -- earlier than expected -- aiming to bring out more from the group of boys and their coach, who became trapped in the Tham Luang cave complex on June 23. Four of the 13 were rescued Sunday, but authorities have not yet identified them publicly and details of their condition remain sparse. "All the equipment is ready. Oxygen bottles are ready... in next few hours we will have good news," Narongsak Osottanakorn told reporters, after announcing the second phase of the rescue bid had begun. "They (the four) are well and happy. This morning they complained that they are hungry and they asked for fried basil with rice," he added in front of global media. But they will be "kept away" from physical contact with their parents until the risk of infection is over, he said, adding doctors will decide on family visits "at a distance or through glass". Narongsak defended the lack of public disclosure of the names of the boys who had already been guided to safety, saying it "will create ill feeling" if their names are released while others languish inside the cave. Officials said that it may "take days" to bring all 12 boys and their coach to the surface. Each boy is being accompanied by two divers and it takes hours to negotiate the flooded tunnels through the dark, murky water. The ordeal has riveted Thailand and captured the world's attention. The search and rescue operation has involved dozens of international experts and rescuers, including a US military team. Elon Musk's Space X rocket company tested a "tiny kid-sized submarine" that could potentially help the children through the narrow, flooded cave passageways. A spokesman for Musk's Boring Co. tunneling unit, which has four engineers at the cave, said in an email yesterday that Thai officials had requested the device. If the tests were successful, the sub would be placed on a 17-hour flight to Thailand. He posted a video of a diver testing the device in a pool. President Donald Trump tweeted yesterday: "The US is working very closely with the Government of Thailand to help get all of the children out of the cave and to safety. Very brave and talented people!" One of the boys, identified as Tun, wrote: "Mom and Dad, please don't worry, I am fine. I've told Yod to get ready to take me out for fried chicken. With love." "Don't be worried," wrote another boy, Mick. "I miss everyone. Grandpa, Uncle, Mom, Dad and siblings, I love you all. I'm happy being here inside, the navy SEALS have taken good care. Love you all." One particularly touching note from another boy said: "I'm doing fine, but the air is a little cold, but don't worry. Although, don't forget to set up my birthday party." In a letter of his own, coach Ekapol Chanthawong apologised to the boys' parents for the ordeal. "To the parents of all the kids, right now the kids are all fine, the crew are taking good care. I promise I will care for the kids as best as possible. I want to say thanks for all the support and I want to apologise to the parents," he wrote.